Incoming has been regularly updated over the last week. Among the many new titles listed, we've added many HD-DVD and Blu-ray discs. There's lots of juicy news from Optimum Releasing, whose release schedule has been ramped up dramatically since the company was taken over by French media giant Studio Canal. The company will release an Ultimate Hammer Box Set containing twenty-one Hammer titles, which Studio Canal own thanks to their acquisition of the Thorn / EMI library. The set, due on October the 23rd, contains: Blood From The Mummy's Tomb, Demons of the Mind, The Devil Rides Out, Devil-Ship Pirates, Dracula: Prince of Darkness, Fear In The Night, Frankenstein Created Women, The Horror of Frankenstein, The Nanny, One Million Years BC, Plague of the Zombies, Quatermass And The Pit, Rasputin: The Mad Monk, The Reptile, The Scars of Dracula, She, Slave Girls, Straight On Till Morning, To The Devil... A Daughter, The Vengeance of She and The Witches. Some titles will also have trailers and photo' galleries. It is not yet known if any of the titles will have new transfers (some, like Dracula: Prince of Darkness and She were previously available in non-anamorphic transfers - see our Hammer DVD Guide for more details). The set has an RRP of £149.99. 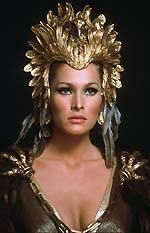 Some of the titles are already scheduled for individual release, in October (The Devil Rides Out, Horror of Frankenstein, Rasputin: The Mad Monk and Dracula: Prince of Darkness) and November (One Million Years BC, Quatermass and the Pit and She). The others will presumably follow next year. Optimum will release the two Amicus Peter Cushing Doctor Who films as The Dalek Collection on September the 25th. The two disc (1 x DVD-5, 1 x DVD-9) set will be housed in a metallic tin, which will contain a copy of the Daleks: Invasion Earth 2150AD poster and a pack of Dr Who and the Daleks trading cards "to start your collection". The press release states that the version of Daleks: Invasion Earth 2150AD will be the "first time on DVD in its original edit". I've queried this, but no-one seems to know what it means. There's some speculation among fans that they're referring to the pre-credits scene (policeman Bernard Cribbins is coshed during a smash-and-grab raid, and stumbles into the TARDIS, mistaking it for a real Police Box). In some versions of the film this has been placed after the title sequence (which is clearly wrong). The version on the review disc has the sequence in the right order, but Optimum are in error if they think that this is the first time the film has been presented like this (even in the UK, the film has been available on DVD this way). There's a small discrepancy between the running times of the old and new versions at the BBFC website, but this is probably attributable to the new - and horribly anachronistic - Studio Canal logo' that now precedes the film. 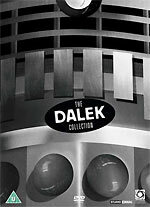 The two-disc set also features the hour-long Dalekmania documentary. However, the copy on the review disc is missing the documentary's opening sequence (which featured Doctor Who regular Michael Wisher as a cinema commissionaire) - it now opens with the opening scene of Dr Who and the Daleks. This means that about two minutes of material is missing, which includes the documentary's title card! This (perhaps inadvertently) revised version runs for 55'45" (including the new Studio Canal logo'). Menu screens and sample screen-grabs from the two discs are available here. Unfortunately I don't have a copy of the Warner Home Video-distributed version to hand to compare the new version with, so I don't know if these are new transfers. A cursory scan through the two films suggests that the transfers are very nice indeed (especially considering that they were shot using the money-saving two-perf Techniscope format). The audio phasing problem that bugged the original UK DVD release of Dr Who and the Daleks (long since rectified) isn't present on the Optimum disc. Optimum will release a new The New Avengers box set on October the 30th (the previous edition, from Contender, has been deleted for many months). The new set will feature at least one episode with a commentary track, featuring star Gareth Hunt and "writer" Brian Clemens. Optimum's forthcoming Don't Look Now DVD, due on November the 13th, will feature a new commentary track by director Nic Roeg! The RRP is £17.99. Optimum have a Tony Hancock Double Bill (Comic Icons) scheduled for October the 16th, featuring his two key features, The Rebel and The Punch and Judy Man. It is not yet known if The Punch and Judy Man will have the infamous "piggy-bank" scene reinstated (it was missing from the last UK DVD release). The RRP is £15.99. The first season of the forensic crime investigation series Bones, which stars Angel's David Boreanez and Emily Deschanel, will be released by Twentieth Century Fox Home Entertainment on October the 9th. 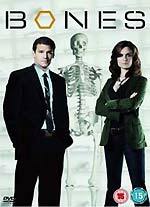 The set will feature "extensive" bonus material, including a commentary track for Two Bodies in the Lab by Boreanez, Deschanel, creator Hart Hanson and Executive Producer Barry Josephson; character profiles; and a selection of featurettes focussing on the science behind the scenes, and the real-life of forensic anthropologist Kathy Reichs, the novelist whose career inspired the series. The RRP is £39.99. Contender's Premier Asia imprint will release the original 2003 Japanese version of The Grudge 2 on October the 9th. This is the film that's currently being re-made in the US, as a sequel to the Sarah Michelle Gellar version of The Grudge. Confused much? The two disc set will offer the film in 1.85:1 anamorphic widescreen format, with a choice of Japanese Dolby Digital 5.1 (448kbps), Japanese DTS (768kbps) or English Dolby Digital 5.1 (384kbps) audio tracks, and a commentary by Japanese movie expert Bey Logan. The set's second disc will feature a couple of trailers; footage from the Japanese premiere (5m); material from the Taiwanese and Korean promotional tours (5m); Kayako on stage (2m); Terror Reborn - The Making of Ju-On: The Grudge 2 (20m); A New Nightmare: Behind the Scenes of Ju-On: The Grudge 2 (24m); Master of Horror - An Interview with director Shimizu Takashi (17m); four deleted scenes (The Curse Continues (1m), I'll Be Right Back (2m), Hidden Depths (1m) and Pieces of the Puzzle (4m); House of Horror (an interactive game-style journey through the haunted house). The RRP is £19.99. A four-disc box set featuring both Japanese Grudge films is being listed by most etailers, but wasn't mentioned by the press release. It has an RRP of £29.99. 4DVD will release the third season of Peep Show on DVD on November the 6th. The disc will feature all six episodes of the series, together with specially-filmed scenes for episodes 1, 3 and 6; audio commentary by Sam Bain and Jess Armstrong (episode 1), Robert Popper and Iain Morris (episode 3) and Robert Webb and David Mitchell (episode 6); and deleted scenes with commentary by series producer Phil Clarke and director Tristram Shapeero. The RRP is £19.99. A box set featuring all three series will also be released on November the 6th, with an RRP of £29.99 (some etailers have this listed for less than £18 - see Incoming). 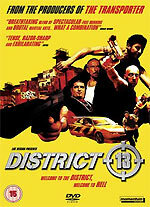 The Luc Besson-produced urban action film District 13 (a.k.a. Banlieue 13) will be released by Momentum Pictures on October the 9th. The film, which recently enjoyed a successful UK theatrical release, features the extreme sport of free running (le parkour). District 13 (named in part to homage John Carpenter, whose films, notably Escape From New York, influenced the movie), is presented in anamorphic 2.35:1 format, with a choice of English or French Dolby Digital 5.1 audio tracks (both at 448kbps). There are optional English subtitles. The film is supplemented by a Making of... featurette (55m); Le singe est de retour (Urban Freeflow documentary on Stephane Vigroux, 35m); Parkour Vision documentary (7m); outtakes (3m); Cyril Raffaelli extended casino fight scene; and theatrical trailers. The RRP is £17.99. Anchor Bay will release the Masters of Horror - Series 1 Volume 1 seven-disc box set on October the 23rd. The set will feature seven of the thirteen hour-long episodes of the acclaimed horror anthology TV series, which includes episodes directed by John Carpenter, Joe Dante, John Landis and Stuart Gordon (amongst others). The episodes included are: Cigarette Burns, Incident On and Off a Mountain Road, Homecoming, Chocolate, Dreams in the Witch House, Deer Woman and Sick Girl. The episodes are presented in anamorphic widescreen (1.78:1) format, and all have DVD-ROM screensaver and screenplay features, stills and / or storyboard galleries and trailers. Each episode is supplemented with bonus features including commentaries, interviews, making of... featurettes, director biographies. If the two episodes released earlier this year are any indication, the bonus material will be substantial and comprehensive. Here's a full list, direct from the press release. The Final Cut DVD has been delayed from September 25th to the 16th of October. 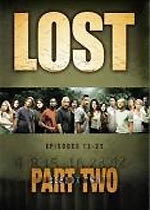 The second half of the second season of Lost will make its UK debut on October the 2nd. The four-disc set features twelve episodes, and an entire disc dedicated to "hours" of bonus material. This will include featurettes Lost on Location (wander the set); Lost Connections (exploring the criss-crossing of the various Lost characters in flashbacks and forthcoming storylines); Lost Flashbacks (never-before-seen flashbacks); Secrets of the Hatch; bloopers and deleted scenes. Some etailers are also listing commentary tracks for Dave (by director Jack Bender and actors Jorge Garcia and Cynthia Watros) and The Whole Truth (from actors Kim Yun-jin and Daniel Dae Kim with writers Elizabeth Sarnoff and Christina M. Kim). The set's RRP is £34.99. HMV are offering an exclusive 28-page episode guide with their version. A complete season two box set will also be released on October the 2nd - it has an RRP of £49.99.